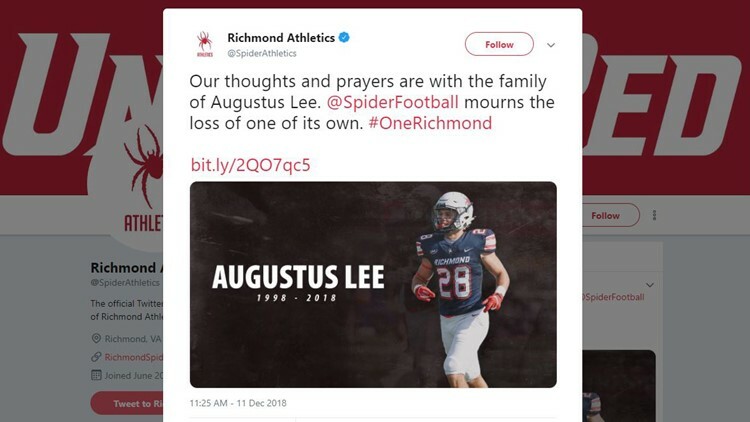 University of Richmond announced the death of football player Augustus Lee. The University of Richmond confirmed that the redshirt freshman defensive back died but did not disclose the cause of death. A University of Richmond football player died Tuesday. The Football Championship Subdivision school confirmed in a news release that Augustus "Gus" Lee, a redshirt freshman defensive back from Fairfax, Virginia, died but did not disclose the cause of death. The Virginia Department of Health's Central District Office of the Chief Medical Examiner did not immediately reply to an email from USA TODAY Sports early Wednesday morning. The Washington Post reported that Lee, who was just 20 years old, had walked on at Richmond after considering Cornell and Delaware. The 5-foot-11, 190-pound defensive back was the defensive most valuable player of the 2018 spring game and had appeared in all 11 of the Spiders' games this season, playing primarily on special teams.